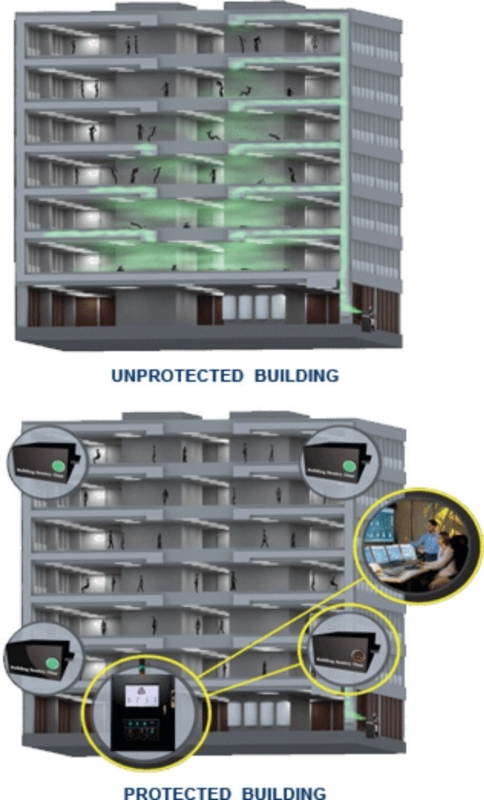 A multi-sensor, fixed chemical detection system has been installed in a Manhattan building to protect the asset and its tenants from a targeted terrorist attack or accidental release of toxic industrial chemicals. The multi-sensor Sentry One platform can be engineered as a retrofit project. Building Protection Systems, Inc. (BPSI) has successfully brought its Building Sentry One chemical detection system online at another undisclosed downtown Manhattan landmark building. The extensive multi-sensor Sentry One platform was engineered as a retrofit project and seamlessly plugged into the existing building management system (BMS) and security platform without major changes to the existing infrastructure, reports BPSI. “There is a mounting and sustained drive by thought-leading building owners to add protections against the huge risks associated with a targeted toxic industrial chemical attack or radiological dirty bomb release. It is akin to the early adopters of building sprinkler systems prior to the tragic Triangle Factory Fires in 1911 where it took an actual fire and large loss of life to push owners to adopt building sprinkler systems,” says Greg Eiler, BPSI’s president. “We are also seeing a security shift to include physical fixed detection at potential target locations alongside the focus of cyber-threats to protect data. The basis of this shift is the very real awareness of the vulnerability of a building’s air handling system and the lone-wolf scenarios targeting innocent people via an airborne toxic release into the HVAC,” Eiler continues. “The safety and security of people within their work environment is paramount. With detection, proven reliability and relative simplicity of the system is very important because false alarms cause a ‘cry wolf’ outcome. BPSI’s type of detection goes well beyond traditional air monitoring and has easily replaced less reliable first generation detector systems that yielded high false alarm rates,” says Mike Welden, senior vice-president of homeland security for BPSI. BPSI provides automated toxin protection life-safety systems for public gathering spaces, mass transit stations and buildings.